LASP was originally founded to develop a stabilized platform for instruments launched aboard sub-orbital rockets. Our rocketry program remains strong today; currently, it’s supported by the NASA Sounding Rocket Operations Contract (NSROC) in order to calibrate the EUV Variability Experiment (EVE) onboard the NASA Solar Dynamics Observatory (SDO) and to fly the Colorado High-resolution Echelle Stellar Spectrograph (CHESS) to study atoms and molecules in the interstellar medium. For the SDO/EVE calibration program, sounding rocket launches are planned annually throughout the mission’s five-year duration. LASP provides the scientific payload; the NASA Goddard Space Flight Center Wallops Flight Facility and their subcontractors provide the rocket motors and control subsystems as part of the NASA Sounding Rockets Program. 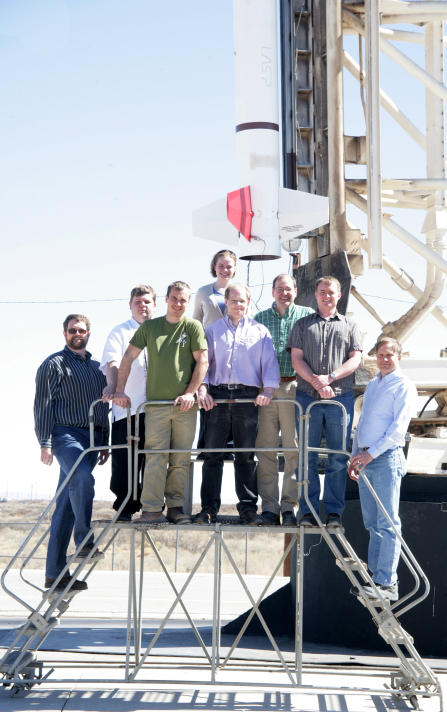 CHESS is an astrophysics payload developed by CU/LASP faculty, researchers, and students. Four CHESS payloads have flown between May 2014 and April 2018. The NASA 36.336 Terrier-Black Brant sounding rocket flight for calibration of SDO/EVE, TIMED, and SORCE had a very successful mission on Monday, June 18, 2018. The initial examination of the data indicates excellent observations. A paper, describing results from the Amptek X123 spectrometer flights in June 2012 and October 2013, was featured in the March 18, 2015 Astrophysical Journal Letters. The X123 instrument was flown successfully on the MinXSS-1 CubeSat. A related NASA feature describes the measurements of solar soft X-rays from the X123 sounding rocket flights: http://www.nasa.gov/content/goddard/nasa-funded-mission-studies-the-sun-in-soft-x-rays. The following video shows the successful NASA 36.290 launch on October 21, 2013, from the White Sands Missile Range in New Mexico. The scientific rocket carried a near-replica of the SDO EVE satellite to check the performance of the EVE optical system. Both EVE and the prototype were built at LASP. Based on the real time data collected from this launch, all of the rocket EVE instrument channels made excellent solar EUV irradiance measurements.